Are you a civil engineer? How many calls do you get every week from agencies trying to offer you a job? If you&apos;re like me probably several. However I was watching TV the other evening and saw an advert from Reed - the "Hate Mondays" campaign and it struck me that we move jobs more often because we have the technology that enables a constant 24/7 watch on relevant job vacancies in a preferred location. Put this technology in the hands of a jobseeker. The result is a potentially endless menu for career advancement where people will job hop more often. Shorter job durations must mean less time to develop ones professional skills within a company. Hence skill shortage. Right? I wasn&apos;t convinced. Having spent some time working in recruitment the general feedback I was hearing was most people would love to have a steady enjoyable job working for a great employer who understands the benefits of work/life balance. So people are choosing to Job Hop. So where does this statistics regarding job hopping come from? Misinformation? I thought I&apos;d do a little digging. In 2012 Forbes published and article that stated "The average worker today stays at each of his or her jobs for 4.4 years". They continue "Ninety-one percent of Millennials (born between 1977-1997) expect to stay in a job for less than three years, according to the Future Workplace “Multiple Generations @ Work” survey of 1,189 employees and 150 managers. That means they would have 15 - 20 jobs over the course of their working lives!" (see full article here). 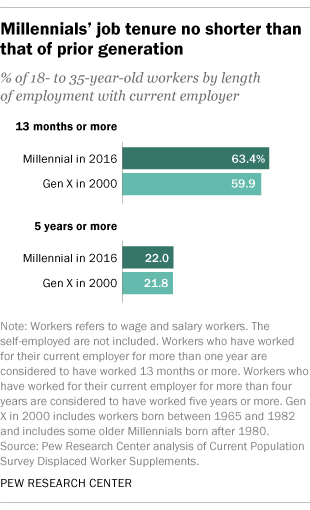 To summarise; millennial workers, those ageed 18 to 35, are just as likely to stick with their employers as their older counterparts in Generation X were when they were young adults, according to recently released data. So if you&apos;re recruiting for civil engineers and you think any of teh following "We just can&apos;t find the staff" or "Kids nowadays?" or "There are no good civil engineers around" then perhaps the problem doe not lie with the jobseekers but perhaps is closer to home. Offer a good working environment, a good salary, a good chance of employment longevity and the good ones will apply. We have over 11,000 civil engineers on our database. If we email them a standard boring advert that you see on every major job board we get lots of applications, but to be frank most of them are poor, irrelevant applicants. Consider this the next time you try to recruit: Focus on the potential candidates&apos; needs first and sell your vacancy on how it could fulfill their needs. There&apos;s no skills shortage. There&apos;s simply the inability of employers to attract the right applicants. Contributors Wanted: We are looking for articles from members who have something to say. Perhaps something you shouldn&apos;t really post on your company page. Perhaps it&apos;s something a little left field of civil engineering, or maybe you just need to sound off about something? Send it to us and if we enjoy reading it then we&apos;ll repost it here.